Sitting in the dimmed "rock room", a solitary candle burning well after midnight, a moody thirty eight year old audience recording crackles into life. The recording starts with the MC announcing the band, and a noisy crowd apprehensive for the performance. A slow syncopated groove begins with a grinding funky organ sliding across the top of it. The regal ambiance of the Rainbow Theatre in London comes across beautifully on this recording. All of the instruments are crisp and defined, exhibiting all of the hallmarks of a professional recording. The unknown jam patiently starts to pick up tempo, suddenly a strangled and heavily wah wah'd guitar slithers reptile like across the gurgling musical landscape. Stevie Winwood peels away the layers of the onion, as he builds a multi dimensional solo piece by piece, just minutes into the performance. The jam comes full circle and then repeats itself, this time with Chris Wood taking an earthy swing at soling over the same changes as Winwood, but on flute. 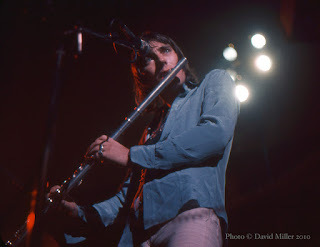 The rhythm section of Jim Capaldi and Rosko Gee turn the key, and lock into a delicious groove. The band is eight minutes into the show and have not said or sang a word, but they are tight and on point as the opening notes of "Heaven Is In Your Mind" start. This is psychedelic jazz mind music, with a dash of funky for the dancing feet, this is "Traffic". "Heaven" swings with a sparceness that suits it well. Winwood's classically crisp voice sounds out clear as a bell. I can honestly say I have never heard the guy sing a bad show. 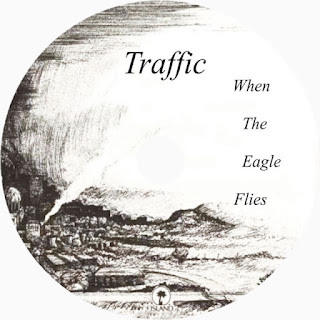 This line up of "Traffic" is made up of Jim Capaldi, Chris Wood, Rosco Gee, and Steve Winwood, a four piece band stripped down from the previous years 7 piece line up. Reminiscent of the 1970 concerts featuring just the three founding members of Capaldi, Wood, and Winwood, this 1974 performance is light as a feather that buoyantly lays on the breeze. The aural warmth of the second generation audience recording, echoes the forest floor feel of the performance. I'm receiving a very "organic" vibe from the show, and the medium I'm enjoying it through. Even though is only months from "Traffic" ending as a entity, the telepathy between the members is still fresh and impressive. The studied "rock geek" will be quick to point out that this show also features two otherwise unreleased "Traffic" songs ,one being the opening jam, and the other named "Vulcan," an unreleased Chris Wood instrumental. The performance is not only musically unique, but the set list contains many musical nuggets to be mined. "Love" twinkles in with a sneaky melody gently caressed by Wood"s virtuous bird song flute lines. When Winwood sings the opening lyrics his voice honey drips with its reassuring and impressive range. What sounds like a Fender Rhodes, states the tunes distinctive circular melody line with its resonate tone. The opening segment's of this performance are as musically satisfying as any live Traffic I have ever had the pleasure to enjoy. An acoustic interlude follows with the band playing exquisite versions of "John Barleycorn Must Die", and "40,000 Headmen" to the attentive crowd. I picture a band of minstrels sitting around an open campfire deep in the English woods. I see a clearing, surrounded by stately trees, an illuminated star filled sky above, and ancient instruments in the musicians hands. This is a haunted and mystical series of Traffic classics performed competently and with great care. Coming out of the acoustic interlude, another instrumental rises from the ashes. As far as I am aware this is an "Untitled" instrumental and a work in progress. Locked into a simple repetitive keyboard and bass groove, Capaldi accelerates the music with his intricate drum fills, fluttering across the kit. The music centers around the mantra created by the hypnotic bass line which allows Wood to improvise some exciting affected saxophone melodies. 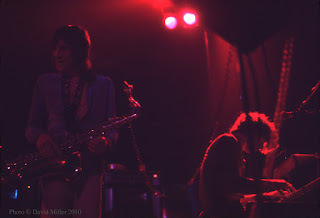 Winwood appears with some heavy jazz inflected organ parts that temporarily disorient the music. Winwood says something unintelligible into the mike, and follows it with a upfront thrilling and trilling keyboard display that brings the music to a close. "Graveyard People" begins with a with horror movie organ introduction that morphs into a space age twisted melody line, laying like warm taffy across the pulsing rhythm section. The song, a union workers lament, is a trance inducing verse, centered around a quintessential "Traffic" piano based breakdown. Wood lays some moaning sax garnishes over the echoed Fender Rhodes halcyon tones. There is a miniscule cut toward the end of the song but nothing to damaging. The tune stretches its legs a bit, then ends, before Winwood introduces "Empty Pages", a complete contrast in mood to the previous number. Thick bass, a hot tempo, and a great keyboard solo highlight this version of "Empty Pages", which prefaces my personal favorite two segments of the concert. "Traffic" favorite "Pearly Queen" starts sparse, but quakes with a harnessed energy that explodes into marching band rim shots by Capaldi and paisley colored "raga" soloing by Winwood. The closing jam aurally shimmers on the audience recording, featuring Winwood laying down impressive scratchy Fender riffs that soar across hot desert landscapes inches from the ground, only to soar toward the heavens unexpectedly. 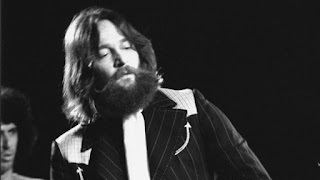 This version brings to mind some early performances of "East/West" by The "Paul Butterfield Blues Band". A brief pause for audience appreciation, before the next song starts. A rigid militant introduction signals the beginning of "Vulcan", an unfinished Chris Wood track that just as suddenly as it started, shifts into a funky beach strut with the emphasis on Wood's "cool cat" blowing on saxophone. Lustrous as a frozen lake, Chris Woods riffs, ripple, shimmer, and quake with a psychedelic vibrato, and a improvisational intent. Saxophone notes made of blue glacier ice, vaporize and reform, the enveloped sound of the distorted horn, pooling in depositories of sound. An epic moment not only for the musical performance aspect, but for the rarity factor. The aforementioned two performances epitomize the "Traffic" ideal; virtuous musicianship, and jazz inflected improvisations. "Dear Mr. Fantasy" comes next and starts slow and lazy, but reaches the appropriate peaks and is sung perfectly by Winwood. Similar to the previous tracks, there is a great attention to detail and crisp professionalism to these songs. This is a song I have heard thousands of times, yet again made fresh by a heartfelt original performance. Hats off to Winwood for another inventive and cheer inducing guitar solo. A ten plus minute version of "Fantasy" that keeps your attention the whole way through with eager playing by all involved. The concert continues with four songs from the "When the Eagle Flies" LP all played uniquely and confidently. The first of these being the title track of the LP, which to me sounds like a precursor to future Winwood solo exploits. A beautiful piano based number, this performance stays true to the LP version with delicate and emphatic vocalization. Winwood stays seated at the piano for the next number, "Walkin In the Wind' a jumpy and skipping stroll straight on into a stiff breeze. My hair blown away from my face as the "Traffic" song is carried on the primitive air. The clasped back beat forged by Gee's plucky bass line and Capaldi's emcompassing kick drum tumbles the song along. Wood's breezy flute exclamations, call like a loon, delicate and swirling. In my opinion the most "developed" song of "When the Eagle Flies", is "Dream Gerrard", and my feelings remain the same after listening to the version from this show numerous times. The tumbling circular central riff of the piano and saxophone embrace, rolling up the body and the mind. The song takes its time and savors every note of its journey. Wood and Winwood share musical ideas like good children, and let the rhythm section keep them in line. The song spins itself into a sustained ball of resounding piano chords and windy wails, and back into the verses. The nebulous lyrics contrast the repetitive ideal of the instrumentation and amazing command of the instruments by the band. This song like many others from this concert extends past ten minutes due to the relaxed atmosphere and amount of improvisation contained. After a impressive and extended Chris Wood sax solo, "Dream Gerrard" is concluded by both drums and bass solo excursions which feature Gee and Capaldi respectively. I can only speculate that this tune would have become a major improvisational vehicle for the band had they continued. The song comes to a crashing percussive conclusion, and the crowd is insane with applause after absorbing the musical genius they just witnessed. I cannot tell from the recording whether the final two songs are post encore break or just a continuation of the performance. Regardless, after the "Dream Gerrard" lift off, the band slows it down with "Memories of a Rock and Rolla" in which the title is pretty explanatory. The song is a refection and a celebration of a rock and roll life, and is a fitting conclusion to the evenings proceedings. The number ends with a party like rave up where Winwood does his best vocal embellishments and the band chugs behind him like a soul review. Wow, the band sounds like they could just keep playing all night, with no signs of fatigue. And apparently the band isn't done playing, and gifts the respectable crowd with a guitar centered untitled instrumental, that contains more than a few over driven Winwood guitar rips. Mired in a weighty serrated jam that would not sound out of place on "Shootout from the Fantasy Factory", the trio of Capaldi, Gee, and Wood lock in to a stone groove in which Winwood weaves multicolored strands of guitar throughout. Again, Winwood's mastery of many instruments is awe inspiring and almost defys definition. The band stretches this one out with Winwood continuing to solo endlessly, until the song concludes somewhat ungracefully, but humorously. The performance of Traffic on May 17, 1974 is by far one of the finest this reviewer has ever heard. I believe the combination of venue, vibe, setlist, and the ability of the artist to improvise fearlessly combined to make this particular show an enchanted experience for all parties involved. The fearlessness of the tapers must not be understated as they are the ones who captured the moment on magnetic tape for posterity so many years ago. The clunk of their microphones and light chatter are subtle reminders of the folks who witnessed and captured a magical night of music many years ago. This performance will be in the rotation for a while, with the dust being blown off of the reels. I highly suggest looking both ways before stepping off of the curb and into this "Traffic", you may come out with tire tracks down your back.